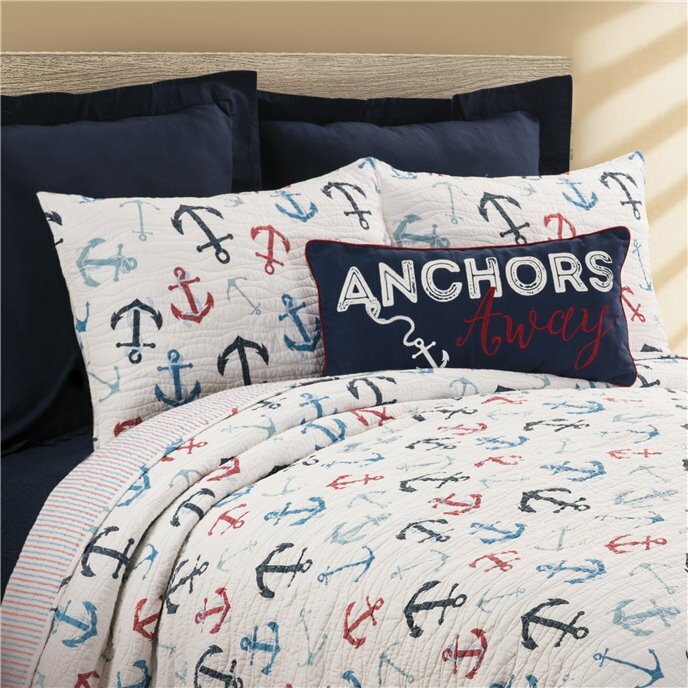 Sail away with the Anchors Away bedding collection by C&F Enterprises. The allover anchor print is done in nautical colors and is just what you need to spruce up your beach house or any room that needs a touch of the sea! The anchors pop off the crisp white background, and the quilt reverses to a red and blue stripe pattern for even more styling options. The collection is 100% cotton and machine washable for easy care. Carry over the nautical theme to your bathroom with the anchor print shower curtain and rug. Navy European shams and a navy bedskirt tie the collection together nicely. Add embroidered nautical pillows to finish off the look! Made by C&F Enterprises. Sail into something new with the Anchors Away Quilt Set. In a red, white, and blue colorway, an allover anchor print is just what your nautical décor has been missing. Reverse to a red and blue ticking pattern for additional styling options. Crafted of cotton, this bedding set is machine washable for easy care. 1 Twin Quilt and 1 Standard Sham, Measurements: Quilt 64" x 86"; Sham 20" x 26" , Hand Guided Wave Stitching, Coordinating Accent Pillows, Euro Shams and Bed Skirt Available Separately, Face 100% Cotton, Fill Material Polyester/Cotton Blend, Machine Wash Cold, Line Dry, Imported. Made by C&F Enterprises. Sail into something new with the Anchors Away Quilt Set. In a red, white, and blue colorway, an allover anchor print is just what your nautical décor has been missing. Reverse to a red and blue ticking pattern for additional styling options. Crafted of cotton, this bedding set is machine washable for easy care. 1 F/Q Quilt and 2 Standard Shams, Measurements: Quilt 90" x 92"; Sham 20" x 26" , Hand Guided Wave Stitching, Coordinating Accent Pillows, Euro Shams and Bed Skirt Available Separately, Face 100% Cotton, Fill Material Polyester/Cotton Blend, Machine Wash Cold, Line Dry, Imported. Made by C&F Enterprises. Sail into something new with the Anchors Away Quilt Set. In a red, white, and blue colorway, an allover anchor print is just what your nautical décor has been missing. Reverse to a red and blue ticking pattern for additional styling options. Crafted of cotton, this bedding set is machine washable for easy care. 1 King Quilt and 2 King Shams, Measurements: Quilt 108" x 92"; Sham 20" x 36" , Hand Guided Wave Stitching, Coordinating Accent Pillows, Euro Shams and Bed Skirt Available Separately, Face 100% Cotton, Fill Material Polyester/Cotton Blend, Machine Wash Cold, Line Dry, Imported. Made by C&F Enterprises. The Sailor's Bay Embroidered Pillow features an anchor and two compasses embroidered in white on a navy pillow. 12" x 24". We offer the complete ensemble in the Sailor's Bay pattern by C & F. Manufacturer's UPC code is 008246332008. Anchors Away! Decorate your home with this fun, nautical pillow, perfect for a beach or lake house. With a red, white, and navy blue color story and piped edge, this printed and embroidered pillow includes a removable insert with a convenient zipper closure. Measures 12" x 24", Contrasting Red Piped Edge, Filled and Finished in USA, 100% Cotton Cover, Fill Material Polyester, Spot Clean, Imported. Made by C&F Enterprises. A sea of anchors in red and blues on a white background create a maritime look. 15.5" x 72", including 1.5" header, 2.25" rod pocket. Cotton. Exceptional value valance has a single layer of fabric. We offer the complete ensemble in the Anchors Away pattern by C & F.
The Anchors Away shower curtain is a maritime themed pattern featuring colorful anchors in red and blues on a white background. 72" x 72". We offer the complete ensemble in the Anchors Away pattern by C & F.
Navy and red hand hooked wool rug features a ship's anchor. 3' round. We offer the complete ensemble in the Sail Away pattern by C & F.